As I was making my plans for racing in 2010, this event was not in the plan. The focus was on getting ready for the Tobacco Road Marathon and then going to Cincinnati in May for the Flying Pig Marathon as a back-up in case I didn't qualify at TR. It's not that I don't like 10 milers. In fact in my younger running days it was my favorite distance. It's just that a hilly 10 mile race didn't fit the plan. 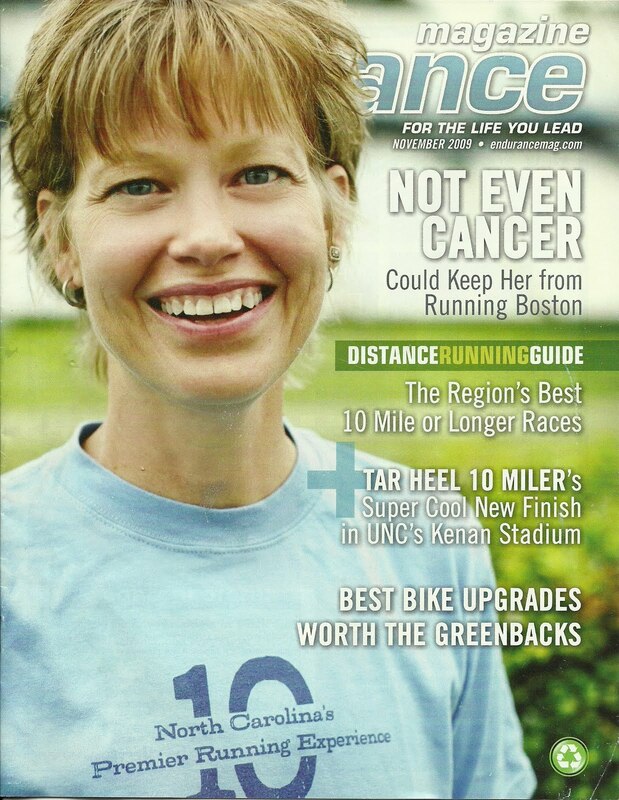 But then Karla was featured on the cover of Endurance Magazine promoting the race and along with that was a comp'd entry for her. And since the proceeds were going to the Cancer Hospital she was excited about it so I decided I would enter to run with her. We thought it would be a good chance for her to go for a 10 mile PR and the pace she needed was just slightly faster than my current marathon race pace so it would be a good workout for me as well as enjoying running with her again. 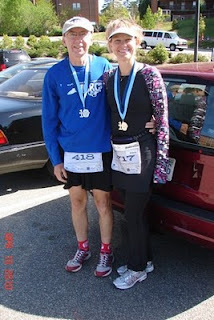 We had actually run her first 10 miler together back in 2005 at the Dash for Cash in Greenville on a very flat and fast course. 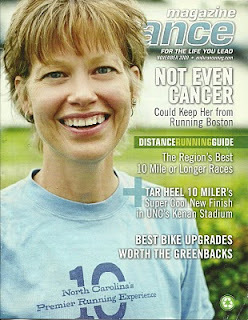 She ran 85:07 that day, just two months before being diagnosed with cancer. Her comeback seems to be complete now with her qualifying at Tobacco Road but it would take a great effort to PR on the hilly Chapel Hill course. I met with her and Frank and our friend Jerry who is on the comeback trail now at 6am in Chapel Hill but Lisa was sick and wouldn't be joining us. Too bad because I know she would have run great on this course. We were very lucky to have perfect weather for running with the start in the upper 40's and only reaching a high of near 60F. Despite our early arrival we didn't plan too well and had to line up without a warm-up but that didn't turn out to be a problem. We lined up with the 8:30 pace group and in just a few minutes the race began. The first mile was a loop with some downhill, some uphill and several sharp turns and with the crowd we were having to be careful making those turns and dodging around other slower starters but amazingly we passed that 1st mile in exactly 8:30. Wow, I'm good at pacing. The next couple of miles went well but were a little frustrating with the narrow streets and crowds and already the leaders were coming back toward us after doing another small loop. Despite that and more little hills we were building a little cushion with `an 8:24 2nd mile and then once the crowd thinned out we ran mile 3 in 8:16. The next couple of miles were relatively flat for this town and we were cruising now. Karla was looking great(as always)and feeling fine. We hit mile 4 in 8:19 and then turned onto Franklin Street. I was enjoying a great workout and trying to entertain The Princess with stories of my visits to CH over the years and pointing out landmarks along the route. we passed the halfway point in 41:42,with mile 5 in 8:13. At that point she said she was getting a side stitch so I told her we would back off the pace a little for her to recover since we had a nice cushion to work with. Mile 6 took us 8:39 and included a hill so we really didn't lose much time. Mile 7 is awesome, all downhill. We took advantage to relax but not push too hard because we knew that we would soon have to be making up that elevation. Mile 7 was 8:16. Mile 8 was mainly flat with a little rise and we hit it in 8:35 just as we hit the beginning of Laurel Hill Road. This mile would be almost all uphill with a very short little break about halfway up. It is through a beautiful residential area of older homes with large wooded lots. It was cool that we were passing people and I was trying to keep Karla's mind off the pain of the hill by pointing out things along the way. I knew if we could get her to the top without losing too much time that the PR should be in the bag. That 9th mile took 9:15 and like that the cushion was gone but she still looked strong and after letting her relax for minute once things leveled out I started to push. Normally I run beside her but now I was running ahead and looking back trying to get her to chase me. This last mile was almost all flat and downhill with only a small rise just before turning toward the football stadium and I knew we were making good time. We finally entered into the stadium but I was unsure of the time it would take to get around so I kept pushing. She responded like the Champion she is and we ran that last mile in 7:58 ! Woohoooo. Pr by 36 seconds by my watch with a time of 1:24:31. We waited and soon Frank and Jerry came into the stadium. Frank had a great race for him and Jerry did well considering how little training he has been able to do this year after having some elective surgery. Overall it was a fantastic day and a wonderful run with my amazing training partner. The race itself needs a few tweaks but overall they did a good job too. Congratulations!! A great suspenseful story.